We offer value and selection in an array of collections that include wool berbers, petite point wiltons, rugged sisals, textured nylons, and our signature "Shagtastic Collection". We work with the nations leading professional interior design firms because they can depend on us for prompt sample service, excellent custom dye capabilities, and the craftsmanship that they expect and deserve. We inventory our imported collections in Riverside California for prompt service. 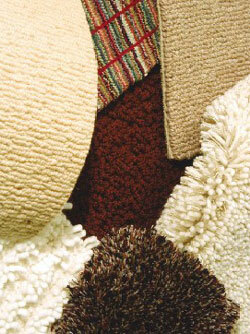 We manufacture rugs and broadloom to the highest standards. We are proud of our reputation as the most trusted name in better end products and over the years our styles have been featured in many leading interior design magazine. Often imitated, never duplicated is our belief. You may find similar styles but you will never find the level of before and after market service that we offer. Your flooring is an investment that should serve you gracefully for many years. Performance and value are available throughout our line. From practical to decadent, contemporary to casual, affordable to unbelievable no one offers more. When you are tired of ordinary carpets and rugs, what you really want is something "Unique."